Here's some thoughts and pictures about firemaking in a survival situation. Click on any picture to see a higher resolution image. Then click the Back button to return to this page. Primitive firemaking, such as with a hand drill, bow drill, and flint and steel, is fun to know and worthwhile skills to practice. But these techniques require materials which are "just right", and you can spend significant time collecting those materials. You would be a fool to enter the woods without a more expedient means of building a fire. Be prepared! I recommend that you carry a ferrocerium rod. These artificial flints throw a shower of sparks. They can be found in all shapes and sizes. I recommend that you tie your rod and scraper together with brightly colored cord, as many people tend to set these tools down in the dirt as they build their fires. The cord makes them much easier to find! The best and cheapest man made tinder is cotton balls dipped in vaseline. Here's a lifetime supply of tinder. 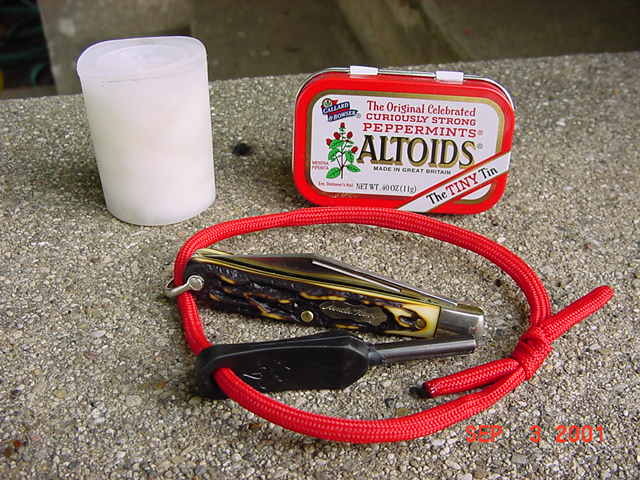 The cotton "fuzz" will easily catch a spark from your sparking rod, while the vaseline will cause the cotton ball to burn for an extended period of time. 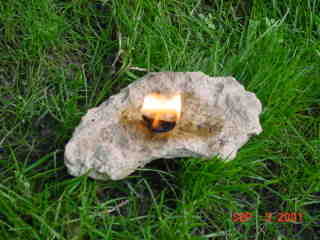 Don't put too much Vaseline on the cotton ball as it will be more difficult to catch the spark. Experiment! Practice! Carry the cotton balls with vaseline in a small container, such as a film canister or a small tin. 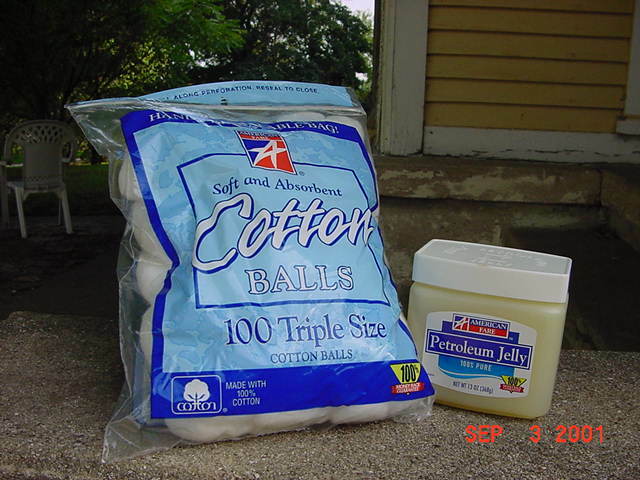 A larger container will hold more cotton balls, but you will be less likely to carry such a container. Keep your rod, scraper, and tinder on your person! Keep a spare set (or sets) in your backpack. I usually use about one half of a cotton ball. It will burn for well over a minute. Of course, this is tinder only. Now you need to add kindling, and finally, fuel. Spend plenty of time preparing your materials before igniting the cotton ball. Indeed, you should prepare three times as much material as you think you'll really need. Three times prep! In addition to a sparking rod, I recommend that you carry a cigarette lighter. These are useful for lighting stoves and candles, as well as melting the frayed ends of nylon cord and providing quick light. Smokers have one (and only one!) 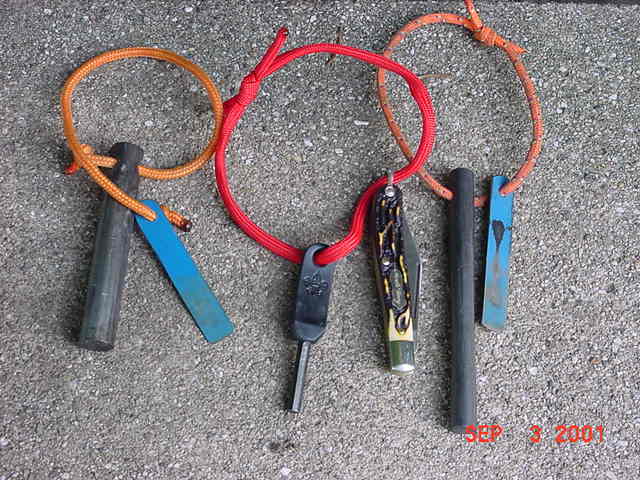 advantage over the rest of us in a survival situation: they are more likely to have a lighter with them. As a nonsmoker, I find that a lighter is easy to forget, and easy to lose. But I never forget or lose my keys. So here's an idea I came up with for carrying a lighter. Cut a length of bicycle inner tube. Sew one end shut. Punch two holes in the open end and round the corners. 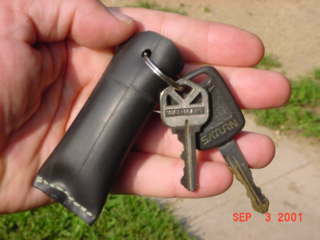 Insert the lighter, and close with a split ring. The lighter will NOT fall out, but on mine I can turn the lighter and push it out past the split ring. The innertube lighter case has the additional benefit of providing ready tinder. 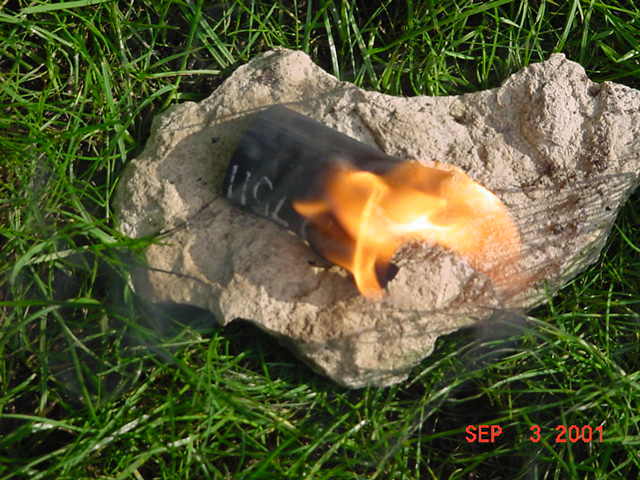 Did you know that innertube will burn? It makes a good tinder. So as long as I have my keys, I have a sure source of fire! Copyright © 2001 by Bill Qualls. Last updated September 3, 2001.